Are you looking for TSPSC Forest Beat Officer Syllabus PDF? Then, go through this article. Here you can get Telangana Forest Beat Officer Syllabus along with the Telangana Forest Beat Officer Exam Pattern 2017-18. Therefore, you can check and download TSPSC Forest Beat Officer Syllabus & Exam Pattern 2017-18 from this page. Here we also provide Telangana Forest Beat Officer Previous Papers with solutions. Hence, TSPSC Aspirants can download Solved TSPSC Beat Officer Previous Papers along with TSPSC Beat Officer Syllabus & Exam Pattern 2017-18. Posts Name Beat Officer, Forest Range Officer. Telangana Forest Department has recently issued a notification to fill 1857 vacancies in the Forest Department. The posts that are going to be filled are Beat Officer, Forest Range Officer (FRO), Forest Section Officer (FSO), etc. Therefore, all the talented and energetic candidates who have interest for the TS Forest Department Jobs can apply for this Telangana Forest Beat Officer Recruitment 2017 before the last date. The Written Exam is main round in the Telangana Forest Department Beat Officer Selection Process because most of the individuals are eliminated only in this round. Hence, to perform well in the Telangana Forest Beat Officer Exam 2017, aspirants must download TSPSC Forest Beat Officer Syllabus and TSPSC Forest Beat Officer Exam Pattern 2017-18 which is provided below. Candidates who applied for Forest Department Jobs in Telangana are surfing various websites in the search of TSPSC Forest Beat Officer Syllabus & Exam Pattern. Hence, for helping those aspirants we have updated the Telangana Forest Department Beat Officer Syllabus and TS Beat Officer Exam Pattern on our website. Therefore, download Telangana Beat Officer Syllabus and TSPSC Forest Beat Officer Exam Pattern 2017-18 from the below sections. To make your preparation easy and efficient, we have mentioned all the topics which are frequently asked in the Telangana Forest Beat Officer Exam. Also, solve Telangana Forest Department Beat Officer Previous Papers to improve your knowledge. Bookmark our website Recruitment Hunt to get more latest updates regarding all Govt Jobs in Telangana. In Telangana Forest Department Online Exam, there shall be three papers viz. Paper I, Paper II, and Paper III. In TSPSC Paper 1, the applicants should write an essay in English / Telugu / Urdu within the time duration of 60 Minutes and it is for 20 marks. The TSPSC Paper 2 contains objective type General Knowledge questions for 100 Marks. TSPSC Forest Beat Officer Paper 3 consists of multiple choice type General Mathematics questions for 100 Marks. The Exam Duration for Paper 2 and TSPSC Beat Officer Paper 3 is 90 Minutes for each. We have also provided the complete topic wise syllabus of TSPSC Beat Officer Syllabus. So, aspirants can check and get TSPSC Beat Officer Syllabus from the below sections. Also, Check and download TSPSC Forest Department Previous Papers here and prepare well for Telangana Beat Officer Exam. 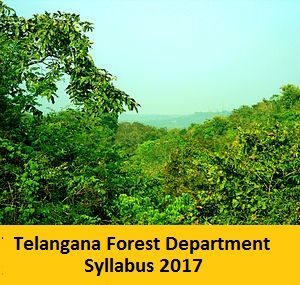 The complete and detailed Telangana Forest Department Beat Officer Syllabus is available below. History – India and The World. Therefore, the Telangana Forest Beat Officer Syllabus and TSPSC Beat Officer Exam Pattern 2017-18 have been provided here. As there are only two papers for the Telangana Beat Officer Exam. So, the candidates who are going to attend Telangana Forest Department Beat Officer Exam 2017 can download Telangana Forest Officer Syllabus & Telangana Beat Officer Exam Pattern from this site. For further information on Telangana Forest Department Jobs, visit www.forests.telangana.gov.in and Book Mark Recruitment Hunt for getting latest govt jobs in Telangana and Govt Jobs In India.